The disposable, light-weight N95 particulate respirator helps to provide quality, reliable respiratory protection. 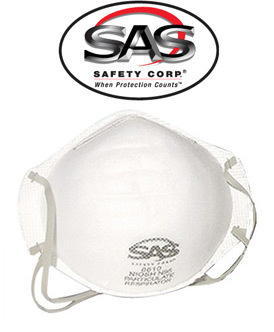 SAS uses a plethora of effective features to assist in your respiratory protection and comfort needs. This dust mask's adjustable noseclip helps provide a custom fit with secure seal and reduces potential for eyewear fogging. These comfort features, along with the lightweight construction promote greater worker acceptance and may help increase wear time.